Buy the “Victory” shirt and support the building fund! Home/News/Buy the “Victory” shirt and support the building fund! A few “Victory” shirts were printed for the pastors and were such a hit we decided to share it with anyone else who would like to have one. 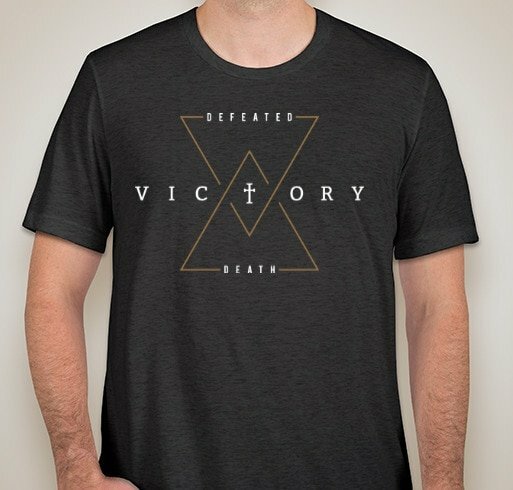 In doing so, you will not only get a great looking shirt with a powerful message of Victory over Death – Death Defeated, but you will be helping build the permanent home of Life Church Calvert. If you would like to purchase one of our Victory shirts, please visit our Fundraiser Page. All proceeds will support our Building Life Together building fund. Shirt orders must be placed by April 30 and will be available the second week of May.